This article is about the city. For other uses, see Vladimir. Vladimir (Russian: Владимир, IPA: [vlɐˈdʲimʲɪr] ( listen)) is a city and the administrative center of Vladimir Oblast, Russia, located on the Klyazma River, 200 kilometers (120 mi) to the east of Moscow. It is served by a railway and the M7 motorway. Its population is 345,373 (2010 Census); 315,954 (2002 Census); 349,702 (1989 Census). Vladimir has a notable significance in Russian history, as it served as the country's capital city in the 12th-13th centuries. Traditionally, the founding date of Vladimir has been acknowledged as 1108, as the first mention of Vladimir in the Primary Chronicle appears under that year. This view attributes the founding of the city, and its name, to Vladimir Monomakh, who inherited the region as part of the Rostov-Suzdal Principality in 1093. It is named there as Volodymyr. On the 17th centuries maps, it was identified as Wolodimer, while its region as Volodimer. Being established long after the city of Volodymyr in Volhynia, initially it was named Vladimir-on-Klyazma. In 1958, the 850th anniversary of the city foundation was celebrated, with many monuments from the celebrations adorning the city. In the 1990s, a new opinion developed that the city is older than this. Scholars reinterpreted certain passages in the Hypatian Codex, which mentions that the region was visited by Vladimir the Great, the "father" of Russian Orthodoxy, in 990, so as to move the city foundation date to that year. The defenders of the previously uncontested founding year of 1108 dispute the claims of those who support the new date, arguing that the new theory was fabricated in order to provide a reason to have a celebration in 1995. 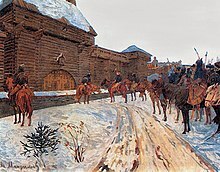 The neighboring town of Suzdal, for instance, was mentioned in 1024. Its 12th-century inhabitants alluded to Vladimir as a young town and treated its rulers with arrogance. In the words of a major chronicle, they said that the people of Vladimir were "their kholops and scions". 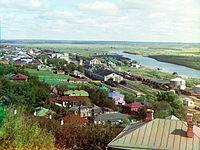 In the seniority conflicts of the 12th and early 13th centuries, Vladimir was repeatedly described as a "young town" compared to Suzdal and Rostov. Nevertheless, the Charter of Vladimir, the basic law of the city passed in 2005, explicitly mentions 990 as the date of the city's foundation. The city's most historically significant events occurred after the turn of the 12th century. Serving its original purpose as a defensive outpost for the Rostov-Suzdal Principality, Vladimir had little political or military influence throughout the reign of Vladimir Monomakh (1113–1125), or his son Yury Dolgoruky ("Far-Reaching") (1154–1157). Under Dolgoruky's son, Andrey Bogolyubsky (1157–1175) (also known as Andrew the Pious), the city became the center of the Vladimir-Suzdal Principality. It had a Golden Age, which lasted until the Mongol invasion of Rus' in 1237. During this time, Vladimir enjoyed immense growth and prosperity. Andrey oversaw the building of the city's Golden Gates and the Dormition Cathedral. In 1164, Andrey attempted to establish a new metropolitanate in Vladimir, separate from that of Kiev. He was rebuffed by the Patriarch of Constantinople. Scores of Russian, German, and Georgian masons worked on Vladimir's white stone cathedrals, monastery, towers, and palaces. Unlike any other northern buildings, their exterior was elaborately carved with high relief stone sculptures. Only three of these edifices stand today: the Dormition Cathedral, the Cathedral of Saint Demetrius, and the Golden Gate. They are included among the White Monuments of Vladimir and Suzdal, designated as a UNESCO World Heritage Site. During Andrey's reign, a royal palace in Bogolyubovo was built, as well as the world-famous Church of the Intercession on the Nerl, now considered one of the jewels of ancient Russian architecture. Andrey was assassinated at his palace at Bogolyubovo in 1175. Vladimir was besieged by the Mongol-Tatars of the Golden Horde under Batu Khan. It was finally overrun on February 8, 1238. A great fire destroyed thirty-two limestone buildings on the first day alone, while the grand prince's family perished in a church where they sought refuge from the flames. The grand prince escaped, but was killed at the Battle of the Sit River the following month. After the Mongols, Vladimir never fully recovered. The most important Ruthenian prince (usually the Prince of Moscow, but sometimes a Tver or another principality) was styled the Grand Prince of Vladimir, but the title had become an honorific symbol of majesty. From 1299 to 1325, the city was seat of the metropolitans of Kiev and All Rus', until Metropolitan Peter moved the See to Moscow in 1325. The Grand Princes of Vladimir were originally crowned in Vladimir's Assumption Cathedral, but when Moscow superseded Vladimir in the 14th Century as the seat of the Grand Prince, the Assumption Cathedral in the Moscow Kremlin became the site of their coronation. The Moscow cathedral was loosely copied by the Italian architect Aristotele Fioravanti from Vladimir's original. 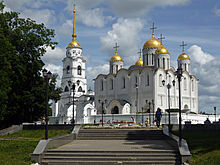 After the rise of Moscow, Grand Princes of Moscow continued to build several new churches in Vladimir. Notable examples include the Annunciation Church at Snovitsy (ca. 1501), three kilometers northwest of the city, and a church in the Knyaginin Nunnery (ca. 1505), which today includes murals dating from 1648. Remains of the prince-saint Alexander Nevsky were kept in the ancient Nativity Abbey of Vladimir until 1703, when Peter the Great had them transferred to the Monastery (now Lavra) of Alexander Nevsky in St. Petersburg. The Nativity Church (built from 1191 to 1196) collapsed several years later, after workmen tried to fashion more windows in its walls in an effort to brighten the interior. The city was the center of Vladimir Province [ru], part of Moscow Governorate from its establishment by Peter the Great in 1708. Vladimir was separated from Moscow Governorate and made the center of a new Vladimir Viceroyalty [ru] by a ukase of Catherine the Great in 1778. In 1796, Paul I's administrative reform transformed the viceroyalty into the Vladimir Governorate [ru] in the same borders. 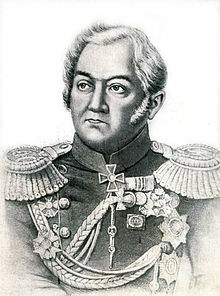 In the years 1838-1840, Alexander Herzen was exiled in Vladimir, passing through the city on the infamous Vladimirka. In December 1858 the city began to operate telegraph. On June 14, 1861, the Moscow–Nizhny Novgorod Railway [ru] began to operate through Vladimir. In 1866, construction of a running water supply was completed, with telephone lines being put up in 1887 and the first electrical power lines on December 5, 1908. In November 29, 1898 Vladimir provincial scientific archival commission was established. After the establishment of Soviet power, many streets were renamed in Vladimir; most of the parish churches were closed and condemned to be demolished. In the first decades of Soviet rule industrialization occurred in Vladimir. On January 14, 1929, the Vladimir Governorate was abolished and the city became part of the newly formed Ivanovo Industrial Oblast. On August 14, 1944, Vladimir became the administrative center of a new Vladimir Oblast carved from Ivanovo Oblast. In 1950 from the basis of the teachers' institute the Vladimir Pedagogical Institute was created. On November 5, 1952 the first trolleybus line began to operate in the city. In 1958 the Vladimir–Suzdal Museum and Reserve [ru] was created, composed of a group of unique architectural monuments of Russian defense and church architecture. The monuments are located in three cities—Vladimir, Suzdal and Gus-Khrustalny—as well as villages of Bogolyubovo and Kideksha. Architecture of the Soviet period is represented by such structures as building complexes and polytechnic colleges, the Torpedo Stadium (built 1952), a reinforced concrete arch bridge over the river Klyaz'ma (1960), the Hotel Vladimir (1956), the Drama Theatre (1971) and others. In 1971 the city was awarded the Order of Red Banner of Labor. Vladimir is the administrative center of the oblast. Within the framework of administrative divisions, it is, together with seventeen rural localities, incorporated as the City of Vladimir—an administrative unit with the status equal to that of the districts. As a municipal division, the City of Vladimir is incorporated as Vladimir Urban Okrug. Vladimir is home to several electrical and chemical factories, several food processing plants and two large thermal power stations. Tourism related to the historical sites is a major contributor to the city economy. The headquarters of the 27th Guards Rocket Army of the Strategic Missile Troops is located in the city. During the Cold War, Vladimir was host to the Dobrynskoye air force base. Since 1861, there has been a railway connection between Vladimir and Moscow. Vladimir is also linked to Moscow and Nizhny Novgorod by the M7 highway. Local transport includes buses, trolleybuses, fixed-route minivans, and taxis. Vladimir bus service links the city to all the district centers of Vladimir Oblast, as well as Moscow, Ivanovo, Kostroma, Nizhny Novgorod, Ryazan, Yaroslavl and other cities. At least 20 pairs of long-distance trains pass daily through Vladimir station, giving Vladimir year-round direct rail links to Moscow (Kursk Station), St. Petersburg and Nizhny Novgorod. Since the summer of 2010 Vladimir (on the Nizhny Novgorod line) is a stopping point for the "Peregrine Falcon" high-speed train. Developed suburban rail: Vladimir was the only city in Russia with concurrent commuter trains two Russian cities with subways. If you go by train from Vladimir, the nearest station in Moscow – "Novokosino", Nizhny Novgorod – "Moscow." In November 2012 the Vladimir–Nizhny Novgorod train was cancelled. The city is served by the Semyazino Airport 5 km west of the city center. Vladimir experiences a humid continental climate (Köppen climate classification Dfb) with long, cold winters and short, warm summers. The magnificent five-domed Assumption Cathedral was designed as a sepulcher of grand princes and dedicated to the holy icon Theotokos of Vladimir, which had been brought to the city by Andrew the Pious. The cathedral was constructed in 1158–1160, expanded in 1185–1189, and painted by the great Andrei Rublev and Daniil Chyorny in 1408. In 1810, a lofty bell-tower was added in Neoclassical style. The warrior-like Cathedral of Saint Demetrius was built in 1194–1197 as a private chapel of Vsevolod the Big Nest in the courtyard of his palace and was consecrated to his holy patron, St. Demetrius. For all its formal unity, the cathedral represents an international project of Russian and Byzantine masters, Friedrich Barbarossa's masons, and carvers sent by Queen Tamar of Georgia. The Golden Gate, originally a tower over the city's main gate, was built in 1158–1164. The gate acquired its present form after having been reconstructed in the late 18th century, to prevent the dilapidated structure from tumbling down. Other remarkable monuments of pre-Mongol Russian architecture are scattered in the vicinity. For more information on them, see Suzdal, Yuriev-Polsky, Bogolyubovo, and Kideksha. Vladimir is also home to the Federal Centre for Animal Health and Welfare. The city association football team, FC Torpedo Vladimir, currently plays in the second tier of Russian football having entered the league after seventeen years of competing in Russian third and fourth tiers. Vladimir VC (previously known as Skat and Dinamo Vladimir) represents the city in Volleyball Major League B – Zone Europe. Vladimir is also home to Polaris-Vladimir ice hockey club, which competes in regional hockey competitions and Russian minor leagues, and Luch, which has both male and female table-tennis teams. ^ Article 7 of the Charter of Vladimir states that the city may have an anthem, providing a decision is reached by the Council of People's Deputies. As of 2015, no such decision has been made. ^ Larin, S. (January 1, 1958). "Gorod Vladimir [1108-1958]: istoriko-ėkonomicheskiĭ ocherk" (in Russian). Владимирское книжное изд-во. ^ Charter of Vladimir, Article 3. ^ Janet Martin, Medieval Russia: 980-1584 (Cambridge: Cambridge UP, 1995), 100. ^ "Weather and Climate - Vladimir Climate" (in Russian). Weather and Climate (Погода и климат). Retrieved April 11, 2016. ^ "Embassy of the Russian Federation in the Republic of the Philippines 2008". Archived from the original on September 15, 2013. Retrieved February 27, 2012. Законодательное Собрание Владимирской области. Закон №130-ОЗ от 10 декабря 2001 г. «Об административно-территориальном устройстве Владимирской области и о порядке его изменения», в ред. Закона №22-ОЗ от 18 марта 2014 г. «О признании утратившими силу части 1 статьи 15 Закона Владимирской области "Об административно-территориальном устройстве Владимирской области и о порядке его изменения" и пункта 3 статьи 1 Закона Владимирской области "О внесении изменений в Закон Владимирской области "Об административно-территориальном устройстве Владимирской области и о порядке его изменения"». Вступил в силу со дня официального опубликования (13 декабря 2001 г.). Опубликован: "Владимирские ведомости", №232, 13 декабря 2001 г. (Legislative Assembly of Vladimir Oblast. Law #130-OZ of December 10, 2001 On the Administrative-Territorial Structure of Vladimir Oblast and on Procedures for Its Change, as amended by the Law #22-OZ of March 18, 2014 On Abrogating Part 1 of Article 15 of the Law of Vladimir Oblast "On the Administrative-Territorial Structure of Vladimir Oblast and on Procedures for Its Change" and Item 3 of Article 1 of the Law of Vladimir Oblast "On Amending the Law of Vladimir Oblast "On the Administrative-Territorial Structure of Vladimir Oblast and on Procedures for Its Change". Effective as of the day of the official publication (December 13, 2001).). Законодательное Собрание Владимирской области. Закон №189-ОЗ от 26 ноября 2004 г. «О наделении статусом городского округа муниципального образования город Владимир Владимирской области», в ред. Закона №108-ОЗ от 10 августа 2009 г «О внесении изменений в Закон Владимирской области "О наделении статусом городского округа муниципального образования город Владимир Владимирской области"». Вступил в силу со дня официального опубликования (1 декабря 2004 г.). Опубликован: "Владимирские ведомости", №333, 1 декабря 2004 г. (Legislative Assembly of Vladimir Oblast. Law #189-OZ of November 26, 2004 On Granting Urban Okrug Status to the Municipal Formation of the City of Vladimir of Vladimir Oblast, as amended by the Law #108-OZ of August 10, 2009 On Amending the Law of Vladimir Oblast "On Granting Urban Okrug Status to the Municipal Formation of the City of Vladimir of Vladimir Oblast". Effective as of the day of the official publication (December 1, 2004).). Владимирский городской Совет народных депутатов. Решение №231 от 29 июня 2005 г. «Устав муниципального образования город Владимир», в ред. Решения №157 от 26 августа 2015 г. «О внесении изменений в Устав муниципального образования город Владимир». 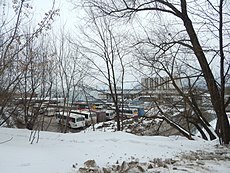 Вступил в силу 4 августа 2005 г. (за исключением отдельных положений, вступающих в силу в иные сроки). Опубликован: "Владимирские ведомости", №251–252, 4 августа 2005 г. (Vladimir City Council of People's Deputies. Decision #231 of June 29, 2005 Charter of the Municipal Formation of the City of Vladimir, as amended by the Decision #157 of August 26, 2015 On Amending the Charter of the Municipal Formation of the City of Vladimir. Effective as of August 4, 2005 (except for certain clauses which take effect on different dates).). Trudy Ring, ed. (1995). "Vladimir". International Dictionary of Historic Places: Northern Europe. FitzroyDearborn. ISBN 978-1-136-63944-9. Retrieved April 4, 2016. 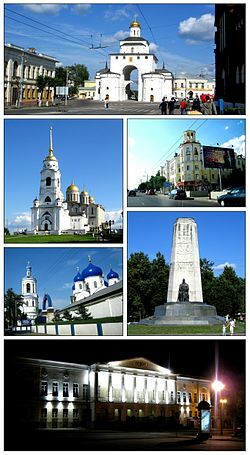 Wikivoyage has a travel guide for Vladimir. 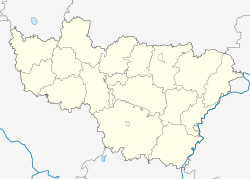 Kovrov is a city in Vladimir Oblast, Russia, located on the right bank of the Klyazma River. Kovrov's population as of the 2010 Census was 145,214; down from 155,499 recorded in the 2002 Census, and further down from 159,942 recorded in the 1989 Census). In terms of population, it is the second-largest city in Vladimir Oblast. In 1977, Kovrov's population had been estimated at 140,000. Gus-Khrustalny is a town in Vladimir Oblast, Russia, located on the Gus River 63 kilometers (39 mi) south of Vladimir, the administrative center of the oblast. Population: 60,784 (2010 Census); 67,121 (2002 Census); 76,360 (1989 Census); 65,000 (1970); 40,000 (1939); 17,900 (1926). Gorokhovets is a town and the administrative center of Gorokhovetsky District in Vladimir Oblast, Russia, located on the highway from Moscow to Nizhny Novgorod. It also serves as a river port on the Klyazma River. Population: 14,016 (2010 Census); 14,524 (2002 Census); 15,783 (1989 Census). Raduzhny is a closed town in Vladimir Oblast, Russia, located on the Pol, Buzha, and Uzhbol Rivers, 12 kilometers (7.5 mi) south of Vladimir. Population: 18,211 (2010 Census); 17,506 (2002 Census). Pokrov is a town in Petushinsky District of Vladimir Oblast, Russia, located 5 kilometers (3.1 mi) to the north of the left bank of the Klyazma River, 82 kilometers (51 mi) west of Vladimir, the administrative center of the oblast, and 100 kilometers (62 mi) east of Moscow. Population: 17,756 (2010 Census); 15,920 (2002 Census); 15,988 (1989 Census); 2,925 (1897).